The right and natural sense of Language includes Literature, just as Literature includes the study of language of literary works. I completed my PhD in Applied Linguistics and ELT in 2017, focusing on authenticity and motivation from an international perspective. I am particularly interested in sociolinguistics, language and identity, language teacher education and the psychology of language learning. I have recently begun researching into the effect of digital media on language, and I am interested in social justice. I have an eclectic mix of interests and I try to be passionate about everything I do. Discussion and Presentation 1 and 2. Writing Workshop 1 and 2 and Advanced Academic English 1 and 2. Lecture course Special Topics in Language Studies. Specialist Seminars on Language and Identity and Language and Digital Media. Teaching Certification courses. 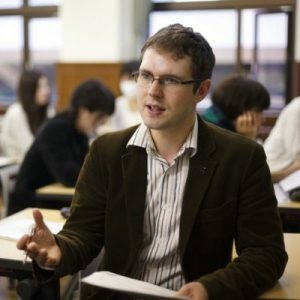 I also teach post-graduate courses on the MA in TESOL, focusing on materials development. The aim of my classes is to promote a better understanding of how to approach literature in a second language and to learn the critical academic skills needed to study at university level. For each class I assign various short texts and poems. Students can choose topics that most interest them to do project work on. I aim to make my classes motivating and empowering for students. Pinner, R. S. (2016). Using self-assessment to maintain motivation in a dynamic classroom environment: An exploratory practice inquiry of one Japanese university speaking course. Asian Journal of Applied Linguistics, 3(1), 27-40. Pinner, R. S. (2016). The nature of authenticity in English as a foreign language: a comparison of eight inter-related definitions. ELTWO Journal, 9(1), 78-93. Pinner, R. S. (2016). Constructing and managing transportable identities on social networking sites. Explorations in Teacher Education, 23(2), 2-5. Pinner, R. S. (2014). The Authenticity Continuum: Empowering international voices. English Language Teacher Education and Development, 16(1), 9 – 17. Pinner, R. S. (2013). Authenticity of Purpose: CLIL as a way to bring meaning and motivation into EFL contexts. Asian EFL Journal, 15(4), 138 – 159. Ikeda, M., Pinner, R. S., Mehisto, P., & Marsh, D. (2013). 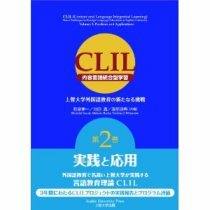 Editorial: CLIL in Japan. International CLIL Research Journal, 2(1), 1- 3. Pinner, R. S. (2013). Authenticity and CLIL: Examining authenticity from an international CLIL perspective. International CLIL Research Journal, 2(1), 44 – 54. Pinner, R. S. (2012). Teachers’ attitudes to and motivations for using CALL in and around the language classroom. Procedia-Social and Behavioral Sciences, 34, 188-192. Pinner, R. S. (2012). Examining Authenticity and Motivation from an International Perspective. JACET ESP Annual Report, 14, 26 -35. Pinner, R. S. (2011). A Two Year Cross-Section of Student Use of Self-Access eLearning. Studies in self-access learning, 2(3), 30 -34. Pinner, R.S. (forthcoming 2018). 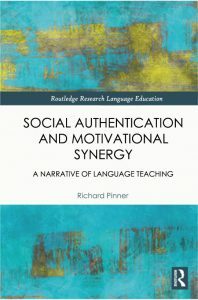 Social Authentication and Motivational Synergy: A narrative of language teaching. London: Routledge. Pinner, R.S. (forthcoming 2018). Augmented Communication: The effect of digital devices on face-to-face interactions. Basingstoke: Palgrave Macmillan. Pinner, R. S. (2016). Reconceptualising Authenticity for English as a Global Language. Bristol: Multilingual Matters. Fogal, G., & Pinner, R. S. (2019). Exploring literary texts as a tool for developing L2 oral proficiency. In C. Jones (Ed. ), Literature, Spoken Language and Speaking Skills in Second Language Learning. Cambridge: Cambridge University Press. Pinner, R. S., & Ushioda, E. (2019). Personalisation and Professionalism: managing the relationship between teachers and learners as people. In R. Lowe & L. Lawrence (Eds. ), Duoethnography in English language teaching: Research, reflection, and classroom application. Bristol: Multilingual Matters. Pinner, R. S. (2015). Authenticity in a Global Context: Learning, Working and Communicating with L2 teachers of English. In J. Angouri, T. Harrison, S. Schnurr, & S. Wharton (Eds. ), Learning, Working and Communicating in a Global Context (pp. 135-139). London: Scitsiugnil Press for the British Association for Applied Linguistics. Pinner, R. S. (2012). Unlocking Literature through CLIL. In S. Izumi, M. Ikeda & Y. Watanabe (Eds. ), CLIL: New Challenges in Foreign Language Education (Vol. 2, pp. 91-129). Tokyo: Sophia University Press. Pinner, R. S. (2010). Setting up Self-Access through eLearning. In T. Pattison (Ed. 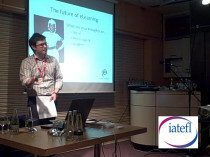 ), IATEFL Conference Selections: 44th International Conference (Vol. 2010, pp. 178 – 180): IATEFL Publications. Pinner, R. S. (2015). Marching to the Beat: Music as a catalyst to the development and popularity of the Beat Generation. English Literature and Language, 52(1), 33-48. Pinner, R. (2015). 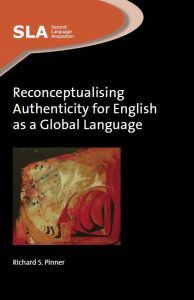 The Quest for “real” Authenticity in EFL. Modern English Teacher, 25(1), 73-75. Pinner, R. S. (2013). Literature and Second Languages: Transcending Linguistic Barriers. English Literature and Language, 50(1), 65 – 75. Pinner, R. S. (2011). VLE or LMS: Taxonomy for Online Learning Environments. CALL Review, 2011(Summer), 5 – 9. Pinner, R. S. (2011). Teaching with social networks. Modern English teacher, 20(3), 37-39. Pinner, R. S. (2011). Making the most of moodle. English Teaching Professional(73), 64-66. Pinner, R. S. (2011). The importance of instructional technology in language teaching. Modern English Teacher, 20(1), 42-45. Pinner, R. S. (2010). Stuck in a rut: adding a dash of culture to help motivate students to progress. Modern English Teacher, 19(4), 33-35. Pinner, R. S. (2010). Regular peer-tutorials as a way of encouraging self-assessment and an alternative to traditional portfolios. Independence(49), 13 – 16. Pinner, R. S. (2009). ELT and the global recession. ELT Journal, 63(4), 390-392. Pinner, R. S. (2017). Social Authentication and the Synergies Between Teacher and Student Motivation: A narrative of teaching at a Japanese university. (Doctoral Thesis), University of Warwick, Warwick. Pinner, R. S. (2010). Teachers’ attitudes to and motivations for using CALL in and around the language classroom. (Master’s Dissertation) King’s College, London. Pinner, R. S. (2003). Female Oppression & the Reversal of Feminine Symbols: Interpreting the Artistic Portrayal of the Minotaur. (Bachelor of Arts), University of Leeds.